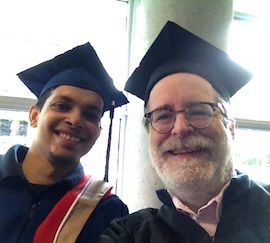 Congratulations to Pain Studies Lab’s Graduating Researchers !!! One of the perks of earning a Ph.D.: the Renaissance-style caps. 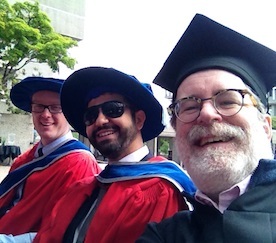 Here, freshly minted Dr. Jeffrey Gunther and Dr. Mark Nazemi with SIAT Associate Director Dr. Chris Shaw. 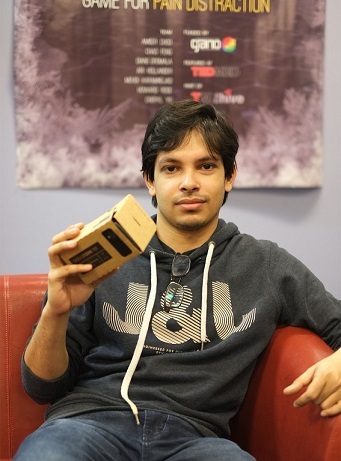 Ashfaq Amin with a version of mobile VR. We’re not sure why it tested so well compared to much more expensive VR displays, but we suspect that one factor might be that immersants use their own smartphones. Stay tuned for more research results! This form of VR display uses a smartphone and is comparatively inexpensive — and thus more accessible than popular VR head-mounted displays (HMDs) such as the Oculus Rift or HTC VIVE. Surprisingly, participants in Ash’s research studies found that their VR experiences using mobile VR were nearly equal to their experiences in more expensive VR displays. Ash conducted studies among chronic pain patients (plus a control group) in one study, and among “healthy” users in another study. Ash’s peer-reviewed papers were extraordinarily popular online, capturing the attention of hundreds as soon as they were posted. Ash now has a nifty UXUI job in Toronto. Ashfaq Amin with Dr. Chris Shaw.